Bay Windows and Bow Windows. Bay and bow windows put your signature on your home, subtly increasing interior space while drawing more light into the room and providing views that would be unobtainable with a typical flat window unit. Bay Window – Three or more fixed sash or panoramic windows, typically with a larger unit in the centre, mulled together on a 30 or 45 degree angle, projecting out from the exterior wall. Bow Window – Four or more fixed sash or panoramic windows mulled together on a 10 or 15 degree angle, projecting out from the exterior wall. 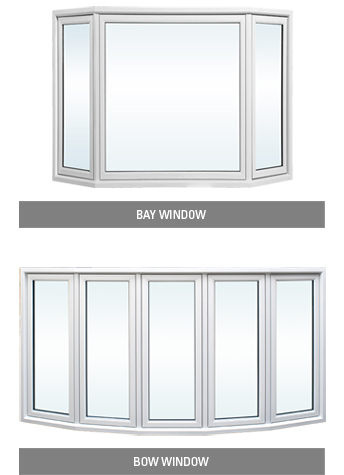 Optional awning, casement or hung windows can be ordered to flank the bay or bow unit. Our window frames feature profile styles made of 100% uPVC extrusions and your choice of four types of insulating glass to ensure superior weather resistance, excellent thermal efficiency and outstanding sound abatement qualities. Standard frame and window colours are white and beige. A variety of features and options are available in this window type including different frame colours, shapes and grille styles. Learn more about the DoubleNature version of this window style.